By honoring a 17-year-old Muslim girl from Pakistan and a 60-year-old Hindu man from India, the Norwegian Nobel Committee linked the peace award to conflicts between world religions and neighboring nuclear powers as well as drawing attention to children's rights. "This award is for all those children who are voiceless, whose voices need to be heard," said Malala, who chose to finish her school day in the central English city of Birmingham before addressing the media. "They have the right to receive quality education. They have the right not to suffer from child labor, not to suffer from child trafficking. They have the right to live a happy life." 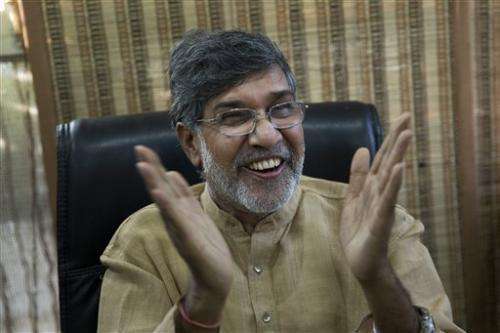 Satyarthi has been at the forefront of a global movement to end child slavery and exploitative child labor, which he called a "blot on humanity." "Child slavery is a crime against humanity. Humanity itself is at stake here. 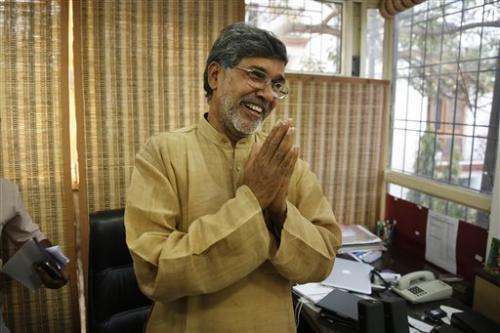 A lot of work still remains, but I will see the end of child labor in my lifetime," Satyarthi told The Associated Press at his office in New Delhi. News of the award set off celebrations on the streets of Mingora, Malala's hometown in Pakistan's volatile Swat Valley, with residents greeting each other and distributing sweets. At the town's Khushal Public School, which is owned by Malala's father, students danced in celebration Friday, jumping up and down. "(The Nobel will) boost the courage of Malala and enhance her capability to work for the cause of girls' education," he told the AP. Malala is by far the youngest Nobel laureate, eight years younger than the 1915 physics prize winner, 25-year-old Lawrence Bragg. Before Malala, the youngest peace prize winner was 2011 co-winner Tawakkul Karman of Yemen, a 32-year-old women's rights activist. In Washington, President Barack Obama called the Nobel announcement "a victory for all who strive to uphold the dignity of every human being." 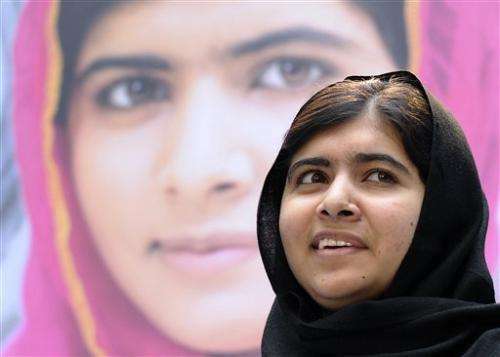 "Malala and Kailash have faced down threats and intimidation, risking their own lives to save others and build a better world for future generations," he said in a statement. In a tweet, first lady Michelle Obama said of the two: "You're heroes to me and millions around the world." "There is a lot of extremism coming from this part of the world. It is partly coming from the fact that young people don't have a future. They don't have education. They don't have a job," Jagland told the AP. Pakistani Interior Minister Chaudhry Nisar Ali Khan said the decision "has given pride to the whole of Pakistan." India's President Pranab Mukherjee said the prize recognized "the contributions of India's vibrant civil society in addressing complex social problems such as child labor." By highlighting children's rights, the committee widened the scope of the peace prize, which in its early days was only given for efforts to end or prevent armed conflicts. "In conflict-ridden areas in particular, the violation of children leads to the continuation of violence from generation to generation," the Nobel committee said. Commentators around the world praised the decision to focus on children's rights. "The biggest threat to the Taliban is a girl with a book," said Margot Wallstrom, Sweden's foreign minister and a former U.N. envoy on Sexual Violence in Conflict. "The true winners today are the world's children," said U.N. Secretary-General Ban Ki-moon. Raised in Pakistan's ruggedly beautiful, politically volatile Swat Valley, Malala was barely 11 years old when she began championing girls' education, speaking out in TV interviews. The Taliban had overrun her hometown of Mingora, terrorizing residents, threatening to blow up girls' schools, ordering teachers and students into all-encompassing burqas. She was critically injured on Oct. 9, 2012, when a Taliban gunman boarded her school bus and shot her in the head. She survived through luck—the bullet did not enter her brain—and by the quick intervention of British doctors visiting Pakistan. Flown to Britain for treatment at the Queen Elizabeth Hospital in Birmingham, she underwent numerous surgeries but made a strong recovery. 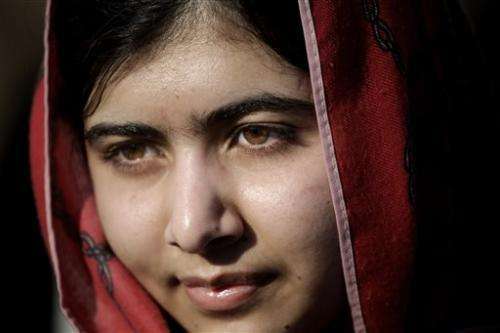 Malala now lives with her father, mother and two brothers in Birmingham. She has been showered with human rights prizes, including the European Parliament's Sakharov Award. 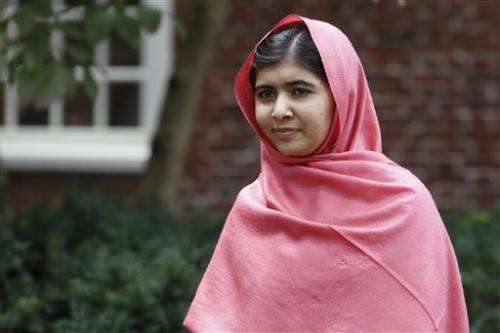 Yet her memoir, "I Am Malala," published last year, reminded the world that she was still just a teenager—one who likes TV shows such as "Ugly Betty" and the cooking show "MasterChef," who worries about her clothes and her hair and wishes she was taller. "Showing great personal courage, Kailash Satyarthi, maintaining Gandhi's tradition, has headed various forms of protests and demonstrations, all peaceful, focusing on the grave exploitation of children for financial gain," the committee said. "The award will have a deep impact not just on the Indian government, but also on the civil society, to work with passion and improve the condition of children by enforcing their rights," he said. The founder of the Nobel Prizes, Swedish industrialist Alfred Nobel, said the prize should go to "the person who shall have done the most or the best work for fraternity between nations, for the abolition or reduction of standing armies and for the holding and promotion of peace congresses." All awards will be handed out on Dec. 10, the anniversary of Nobel's death in 1896.